Konsumsi sudah dalam satuan TJ maka dengan mengalikan dengan factor emisi CO2 akan didapatkan satuan akhir emisi CO2 dalam kg CO2 . Tinggal dikonversi dari kg CO2 ke ton CO2 atau Gigaton CO2. Stephen A. Rackley. Carbon Capture and Storage. 2010. Elsevier Inc.
Pernah ada pertanyaan di forum penelitian, setelah CO2 ditangkap terus diapakah gas tersebut ? Itu untuk penelitian penangkapan CO2 dengan adsorption. Apakah adsorbent yang sudah jenuh disimpan aza ? Itu namanya memindahkan masalah ke masalah lain. Lagi baca-baca jurnal tentang penangkapan CO2 keluar jawaban untuk hal di atas. Meskipun ini untuk absorption, bisa juga untuk metode penangkap CO2 yang lain :-). The process for post combustion capture consists of four stages as sketched in Fig. 1. First, CO2 is removed from the flue gas by absorption in a packed absorber column. Then ‘rich’ solvent containing CO2 is led to a desorber column and heated in a reboiler to release the CO2. Next, CO2 is compressed and transported to a geological storage site or injected into an oil and gas reservoir. Finally the regenerated ‘lean’ solvent is recycled to the absorber. Temanku ketika penelitiannya menggunakan metode ini untuk analisa CO2 di udara ambien. Prinsipnya adalah penyerapan CO2 ke dalam larutan berisi Ba(OH)2 (Barium Hidroksida) yang menghasilkan endapan BaCO3 (Barium Carbonat), kemudian kelebihan Ba(OH)2 ini dititrasi kembali dengan larutan HCl dengan indikator phenolphtalein. Kalau menggunakan metode ini pastikan konsentrasi Ba(OH)2 lebih besar dari konsentrasi CO2 karena ini metode ini menggunakan prinsip back titration. Selain itu jangan lupa analisa blank juga. Adsorption is a physical process that involves the attachment of a gas or liquid to a solid surface. The adsorbent is regenerated by the application of heat (temperature swing adsorption, TSA) or the reduction of pressure (pressure swing adsorption, PSA). Adsorbents which could be applied to CO2 capture include activated carbon, alumina, metallic oxides and zeolites. Current adsorption systems may not be suitable for application in large-scale power plant flue gas treatment. At such scale, the low adsorption capacity of most available adsorbents may pose significant challenges. 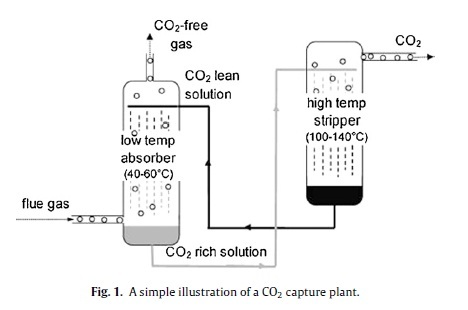 In addition, the flue gas streams to be treated must have high CO2 concentrations because of the generally low selectivity of most available adsorbents. For instance, zeolites have a stronger affinity for water vapour. This involves the physical absorption of CO2 into a solvent based on Henry’s law. Regeneration can be achieved using heat, pressure reduction or both. Absorption takes place at high CO2 partial pressures. As such, the main energy requirements originate from the flue gas pressurization. Physical absorption is therefore not economical for flue gas streams with CO2 partial pressures lower than 15 vol%. Typical solvents are Selexol (dimethyl ethers of polyethylene glycol) and Rectisol (methanol). Cryogenics separation separates CO2 from the flue gas stream by condensation. At atmospheric pressure, CO2 condenses at −56.6 ◦C. This physical process is suitable for treating flue gas streams with high CO2 concentrations considering the costs of refrigeration. This is typically used for CO2 capture for oxyfuel process. When membranes are used in gas absorption, membranes act as contacting devices between the gas stream and the liquid solvent. The membrane may or may not provide additional selectivity. These offer some advantages over the conventional contacting devices such as packed columns as they are more compact and are not susceptible to flooding, entrainment, channelling or foaming. They, however, require that the pressures on the liquid and gas sides are equal to enable CO2 transport across the membrane. Their separation efficiency such as flue gas streams from oxyfuel and IGCC processes. In membrane-based separation, selectivity is provided by the membranes themselves. These usually consist of thin polymeric films and separate mixtures based on the relative rates at which constituent species permeate. Permeation rates would differ based on the relative sizes of the molecules or diffusion coefficients in the membrane material. The driving force for the permeation is the difference in partial pressure of the components at either side of the membrane. However, the selectivity of this separation process is low and thus a fraction of the CO2 is captured. In addition, the purity of the captured CO2 is low for the same reason. Multistage separation is employed to capture a higher proportion of CO2 incurring extra capital and operating cost. Chemical absorption involves the reaction of CO2 with a chemical solvent to form a weakly bonded intermediate compound which may be regenerated with the application of heat producing the original solvent and a CO2 stream. The selectivity of this form of separation is relatively high. In addition, a relatively pure CO2 stream could be produced. These factors make chemical absorption well suited for CO2 capture for industrial flue gases.